I came home from my walk this morning and my kids said they wanted Chocolate Surprise Cake. Since I didn’t know what that was, they explained it to me. “You know, a cake with a surprise in it…like toys.” Okay, since I can’t remember EVER baking a cake with toys in it, I suggested candy. They liked the idea. However, I felt too lazy to make a cake from scratch and they just wanted chocolate, so I used a brownie mix. It couldn’t have been easier. These will be great for the boys on Valentine’s. Sometimes I think kids get the shaft on Valentine’s Day as we all seem to be concentrating on our significant others. This will make them feel special and experience the “chocolate love” we all tend to go crazy for on that day…well at least I do. These couldn’t be simpler to throw together as you will see. First, find a few of the 46,578 Hershey’s Kisses you have left over from the holidays. Prepare your brownie mix according to package directions. 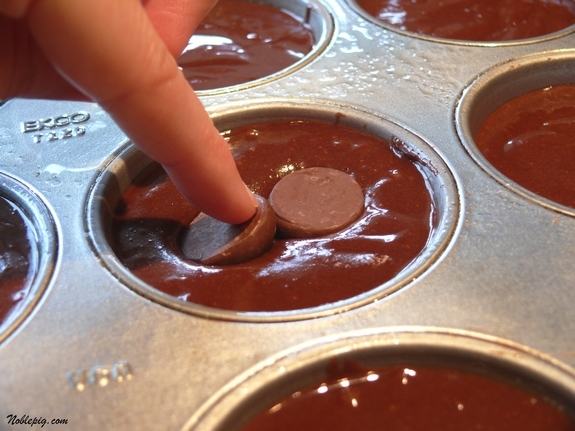 Pour batter into muffin cups that have been sprayed with nonstick cooking spray and place two chocolate kisses in the center of each cup. Use a spoon to cover the kisses with the batter. Bake until the edges of the brownies are done, you will have to watch them. I let them cool in the pan for 5 minutes and ran a knife around the edges and under the bottoms before I turned them over and flipped them out; they are very moist. 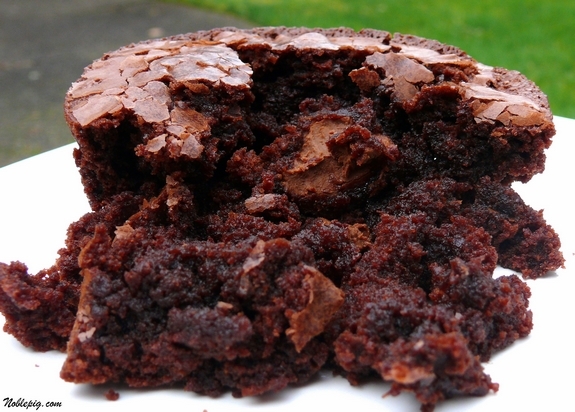 The middle is so moist, almost like a lava cake but the chocolate is not so oozy. The kisses become really soft and melty and taste fantastic. The kids loved it. So did I. 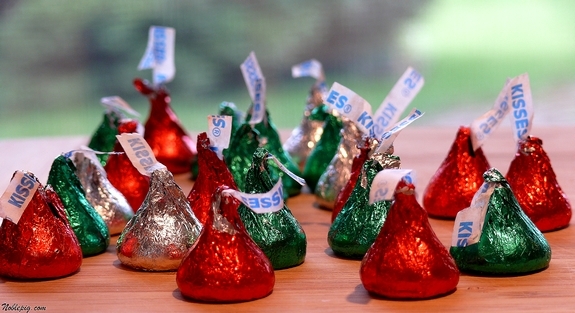 First, find a few of the 46,578 Hershey's Kisses you have left over from the holidays and unwrap them. Prepare your brownie mix according to package directions. 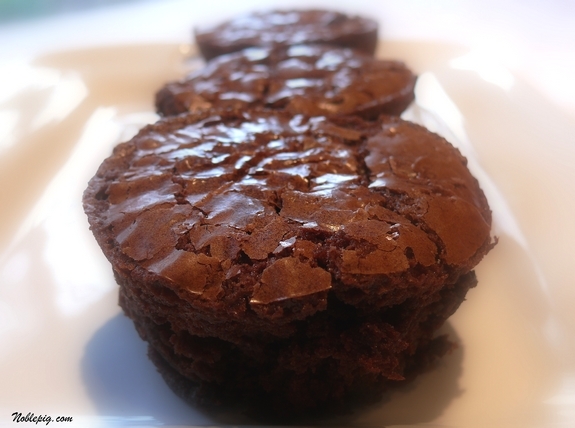 Pour batter into muffin cups that have been sprayed with nonstick cooking spray and place two chocolate kisses in the center of each cup. Use a spoon to cover the kisses with the batter. Serve immediately, while the chocolate is still melty. oh my. heavenly. I could use one of those right now. i find myself snacking on chocolate all day long. I need something big and bold to satisfy the craving once and for all. Chocolate and more chocolate … sounds perfect to me! You’re right that Valentine’s Day can leave kids out. But, we’ve usually made Valentine’s Day special by making treats for others and enjoying some ourselves as well. We have made heart holders for our homemade pink mints and filled tins with homemade cut-out cookies–hearts with pink frosting. I prefer making cut-out cookies for V Day rather than during the holidays, because it’s more relaxed. The French have a cake with a toy or dried bean inside for Epiphany Day in January. It’s called GALETTE des Rois (King’s Cake). It’s puff pastry w/ almond filling. It’s fun to get the prize! This looks like so much chocolatey goodness, I must hide what I’m reading from my family. 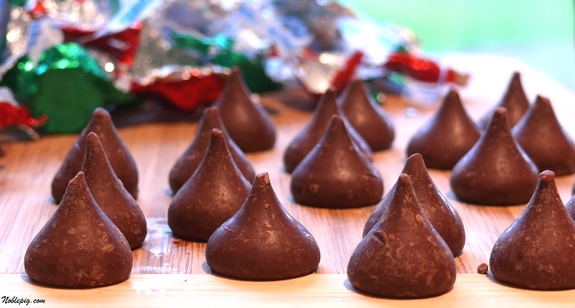 Leftover chocolate kisses? Are you mad? OMG I have so many of those kisses around right now…I must them..must..must…must. That is a great idea! I’m sure my son would love that too. I had made cookies with mini snickers in them. I’ll be you could use them in these too. 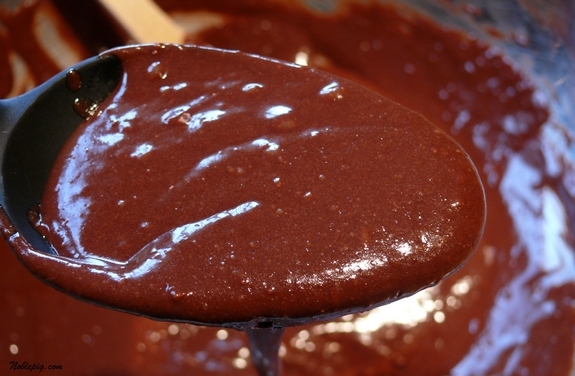 Love the idea of using a brownie mix…..anything to make life easier these days!!! Ooh, ooh, yer killin’ me! Fabulous idea! YUM! I would love these with dark chocolate! Always nice to find a surprise like this. MMMM. I must make these, although I think a dark chocolate Dove promise in the middle is more my speed. Yep, kids will ask for anything, LOL. These look so easy and simple…love it. This is very similar to what The Pioneer Woman posted today– another example that great minds think alike!!! This would definitely hit the spot when I am craving something chocolate! Your boys are so,so lucky!! I hope they know what a great mom they have! My Gosh this looks good!! I make something similar to this, but with mini muffin tins and mini Reese’s cups. People go crazy over them, and the hardest part is taking the candy out of the wrappers! Hello, I have made these same little surprises for my children. I did not have any kisses on hand but, did have cherries. Needless to say I stuffed a cherry into the middle of each one. I now make them for the holidays every year. Love it! Easy to do and I’m sure it tastes great. Oh my these look so good – you’ve got me craving chocolate. Oh no! I live with a couple of kids who would love these! I made these with Hersheys Candy Kisses during Christmas Holidays. Delicious! Sprinkled crushed candy cane on top. Found on someone’s blog, just don’t remember which one. We never have left over Kisses here. But I am soooo making these! Made these today for me and the hubby…we each devoured two! Thanks for easy recipe! Love the texture, looks really moist! Very clever idea. They are just screaming for a scoop of vanilla ice cream. Pillsbury makes the best brownie mix. K3 used to be addicted! And the little kisses in the middle? Inspired! Ummm… either way, it’s delicious. Who can argue with brownies, and surprises? It is the simple little things in life that I love. These are one of them. These will be a big hit at my house. I ALWAYS have Kisses around and brownie mix. How they became staples I’m not sure, but I am prepared to make them tonight! How clever! Brownie mixes are a true wonder. I use a mix more often than I bake them from scratch. And that’s a great use for Hershey kisses! whoa—-i just gained 2lbs by imagining the taste of these. And I can’t wait to make these and gain 6 more!! They look DELICIOUS!!! 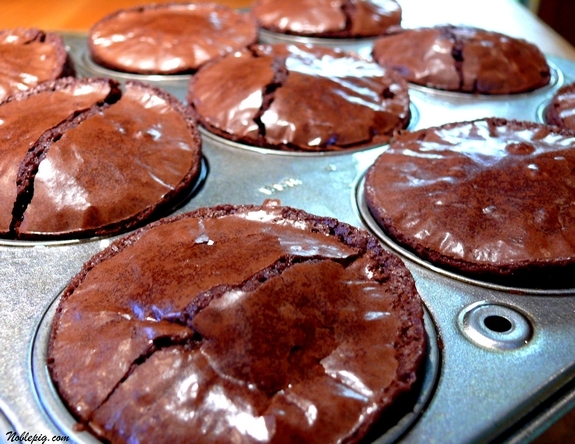 Hey, I made these and I used a non-stick cupcake pan AND I sprayed it and they still stuck to my pans. Any suggestions? I thought of using a cupcake liner next time. Hmmm. I used a knife and went around the sides and a little on bottom before I turned them over. A liner would work too. Now this is a fun idea. These are the kinds of cakes great to freeze and then microwave when you get that chocolate craving. I hope you can get back on my site. I am changing my software, but it’s taking me time, and then all problems will be fixed. Some specialists state that loans help a lot of people to live their own way, just because they can feel free to buy necessary things. Moreover, a lot of banks offer student loan for all people.